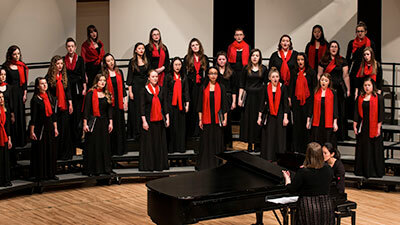 Directed by Anne Gassman (with Prof. Rhonda Fuelberth as faculty advisor), University Chorale is a women's vocal ensemble that performs a varied repertoire of soprano/alto literature. Through the study and performance of diverse musical expressions that represent a variety of historical and cultural perspectives, students participating in University Chorale develop the knowledge, skills, interests, values, and attitudes associated with individual and ensemble musicianship and artistry. The ensemble provides the opportunity to prepare and present varied music; and to enhance individuals’ skills in singing, listening, and application of related artistic skills. In a broader sense, University Chorale serves composers, performers and listeners by presenting choral performances of the highest quality possible. Class activities promote music literacy, involve students in kinesthetic activities to help them connect physically to music, and prepare students to become independent musicians. University Chorale joins other university choirs for joint concerts several times each year. In addition to their dedication to the performance of high-quality treble literature, University Chorale has also performed larger works with the University of Nebraska, Lincoln and Omaha Symphony Orchestras. They have been invited to sing for state, regional, and national conventions of the American Choral Directors Association and the Music Educators National Conference (now the National Association for Music Education). Auditions: Membership is open to any female singer enrolled in the university. University Chorale is a non-auditioned group, and students from throughout the University are encouraged to participate. Rehearsals are 150 minutes a week, MWF from 3:30 to 4:20. For more information, contact director Anne Gassmann or Prof. Fuelberth.